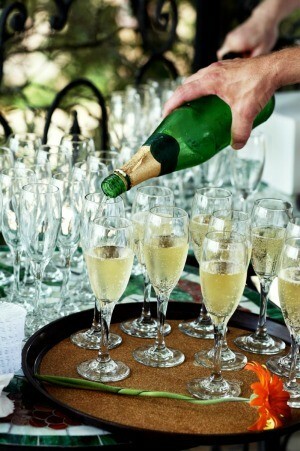 The serving of champagne as a wedding toast is a tradition still seen at many receptions. Determining how to orchestrate the toast to include the wedding party and guests is an important aspect of your planning process. This is a guide about serving champagne for a wedding toast. When the toast is made to the bride and groom we will have wine glasses for the bridal party. What do we do about the other people at the reception? Is it OK to just use a regular cup? This is an informal country outdoor wedding and we won't have regular table wear. We thought of providing the wedding party glasses as part of their attendants gifts. Or are there plastic "wine glasses" sold for such occasions? I don't want to look too "tacky", but am not sure what to do. 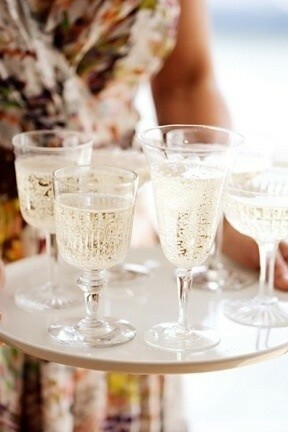 Yes, there are plastic champagne glasses perfect for your guest's wedding toast. In fact, you can buy them at Dollar Tree! I would go to thrift stores and buy mismatched wine glasses. You can send them home with the guests afterward as a souvenir! Jelly jars or canning jars are sometimes used, too. Yes, they do make plastic wine glasses, both two part(stem and bowl snap together) and 1 piece; but you can also get relatively inexpensive glass wine glasses at the dollar store for the other guests. If the wedding is being catered, you can sometimes rent glasses.